(16/P126) TRENTON – Residents of Newark and surrounding areas are breathing cleaner air as a result of new pollution-control equipment that has been installed at the Covanta Essex Resource Recovery Facility in Newark under an equipment-modernization plan reached between the facility and the Christie Administration, Department of Environmental Protection Commissioner Bob Martin announced today. The waste-to-energy plant recently completed installation of its third and final baghouse, structures equipped with fabric filters that capture dust, particles and other pollutants, much like a household vacuum cleaner but on a massive scale. The construction of the three baghouses was the key piece of a voluntary agreement Covanta and the Port Authority of New York and New Jersey reached with the Department of Environmental Protection to modernize pollution controls at the 26-year-old facility. Covanta Energy operates the plant under a long-term lease with the Port Authority, which owns the facility. The upgrade of pollution controls stemmed from requests by Newark residents. The resource recovery facility, which creates energy by burning municipal solid waste, recently completed installation of its third state-of-the-art baghouses, one for each of the facility’s three combustion units. A baghouse is a massive box-like structure equipped with huge fabric filters that collect dust and particles before combustion byproducts are emitted from the stack. The baghouses replace less efficient electrostatic precipitators and are part of a 2012 agreement addressing emissions from the facility, which serves the refuse disposal needs of 22 municipalities in Essex County and the surrounding region. Under this agreement, the company has invested $90 million in emission-control improvements. The DEP issued permits for construction of the baghouses on Oct. 27, 2013. 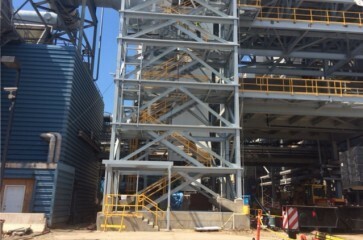 The facility was never out of compliance under its permits allowing use of electrostatic precipitators, but moved forward with the improvements to more closely align with Governor Christie’s clean air goals. The Port Authority in 2012 approved a 20-year lease extension with Covanta that will extend through 2032 as well as a 20-year contract to accept solid waste from the New York Department of Sanitation. A portion of the revenues from this contract funded the air-pollution control upgrades. The construction of the baghouses was scheduled in phases with an expeditious timetable calling for completion and operation of all three baghouses by the end of this year. Stack tests have demonstrated significant reductions of particulates, metals and other pollutants. The waste-to-energy facility generates approximately 500,000 megawatt-hours per year of electricity from municipal solid waste, while also recycling about 15,000 tons of ferrous metal. Other air quality improvements resulting from the contract between the Port Authority and New York City have included construction of a compressed natural gas alternative-fuel station to serve trucks using the facility.